They are tiny, slender insects with rasping mouthparts. Most are plant feeders that scar leaf or fruit surfaces. Adult thrips are slender and small and tend to feed in buds within furled leaves, or in other unexposed areas of the plant; their damage is often observed before the thrips can be seen. Numerous black specks of feces scattered over a stippled leaf surface is a clue that damage is caused by thrips, but look for the insects themselves. Many landscape trees are hosts. Thrips can be a serious pest of California pepper tree, ficus, magnolia, dogwood, acacia, grapes, peaches, nectarines and herbaceous plants. The thrips life cycle includes the egg, two actively feeding nymphal stages, non-feeding pre-pupa and pupa stage, and the adult. Metamorphosis is between gradual and complete. Thrips eggs are kidney- shaped and very large in relation to the female; they are laid within the leaf tissue. 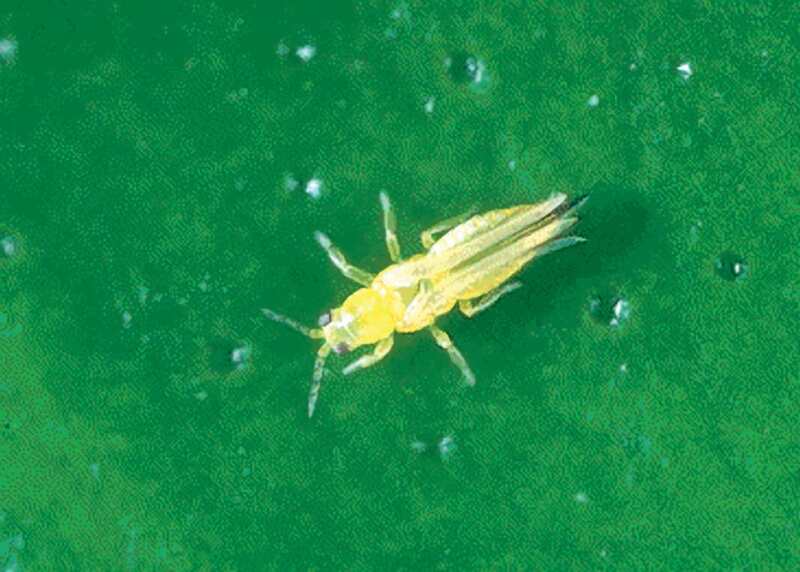 Thrips have several generations (up to eight or more) per year. The life cycle from egg to adult may be completed in as short a time as 2 weeks when the weather is warm. Damage caused feeding by thrips adults or nymphs causes tiny scars on leaves and/or fruit, called stippling , and can stunt growth. Damaged leaves may become papery and distorted. Infested terminals may discolor, become tightly rolled and drop leaves prematurely. Thrips prefer to feed in rapidly growing tissue. Black, varnish-like specks of excrement are a distinguishing feature of thrips activity. Thrips can cause dead spots or blotches to appear on flowers.